North Carolina State University and the North Carolina Department of Agriculture and Consumer Services invite you to attend this event designed to provide a time for researchers to share the latest information of the work being conducted on energy crops in Western NC. Tours of research plots and processing equipment demonstrations will help growers, researchers, and private industry interests learn how we are working to meet the state’s renewable fuels and energy goals of the future. The afternoon event will cover topics including the science of cellulosic fuel production, production of energy grasses, cultural management of bioenergy crops, high-oil crops and biodiesel production, sorghum production for biofuels, breeding efforts and genetic improvements of biomass crops. Speakers include NC State University researchers in Soil Science, Horticultural Science, Biological and Agricultural Engineering, and Forestry and Environmental Resources, and biofuel industry representatives. Field demonstrations will include small-scale gasification, oilseed crushing and biodiesel production, and sorghum harvest, squeezing, and distillation. The field day is free and open to the public. For more information, please contact Ron Gehl by email or 828-684-3562 x129. Jeff Chandler, Director, Mountain Horticultural Crops Research and Extension Center, NC State Univ. 1. 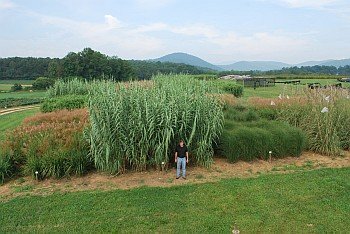 The Importance of High-Yielding Biomass Crops to Future Development in North Carolina. Matt Harrod, Director, Agro Supply Chain Development, Chemtex International, Inc.
2. Using Biodiesel is Easy! Note-- If you have a disability or desire any assistive devices, services or other accommodations to participate in this activity, please contact the N.C. Agricultural Research Service at 919.515.2717 during business hours of 8 a.m. to 5 p.m. to request accommodations.